Tesla Motors Inc. submitted a dealership application to the Michigan Secretary of State Office in November as a precursor for the company to attempt to overthrow the state’s ban on directly selling vehicles to consumers, The Detroit News has learned. Tesla Motors Inc. submitted a dealership application to the Michigan Secretary of State Office in November as a likely precursor for the company to challenge the state’s ban on directly selling vehicles to consumers, The Detroit News has learned. A Tesla spokesperson on Monday confirmed that the Palo Alto, California-based automaker submitted applications last year to sell and service its luxury electric vehicles in Michigan as a way to confirm that legislation signed by Gov. Rick Snyder in October 2014 bans the company’s business model of forgoing franchised dealers and selling cars directly to customers. Tesla has not shied away from litigation over laws that ban its direct-sales approach. In most states, Tesla has won litigation to sell its cars direct to consumers, or reached a compromise that allows the company to open some operations. Lawsuits have involved state agencies as well as dealership groups that have challenged the company’s operations. Secretary of State spokesman Fred Woodham said over the weekend that the department is reviewing Tesla’s applications and a decision is expected “in the next month or two.” He declined to comment on what happens following a decision from the state. 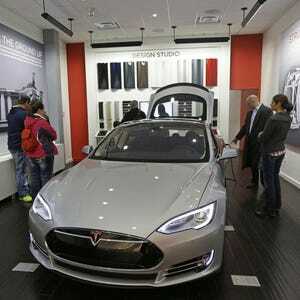 Tesla applied for a “Class A” dealership license to sell new and used cars. Under the classification, it also must have a repair facility as part of the business or have an established relationship with a licensed repair facility. The applications came slightly more than a year after Michigan legislation against the direct-sales model had been approved overwhelmingly by both houses, and was backed by Michigan’s new-car dealership lobby. The law closed a loophole that Tesla has used in other states to maintain company-owned retail stores and bypass the dealership system. The bill was initiated by the Michigan Automobile Dealers Association, an East Lansing-based trade association that represents the interests of more than 650 franchised new-vehicle dealerships in the state.